He likewise felt a need to earn his place in God’s service. As a young minister, Leavell ventured into the small country towns of Mississippi to establish churches and missions, later guiding their growth. This type of evangelistic work attracted the attention of the Home Mission Board of the Southern Baptist Convention. Leavell was asked to lead a department that would teach churches how to evangelize. 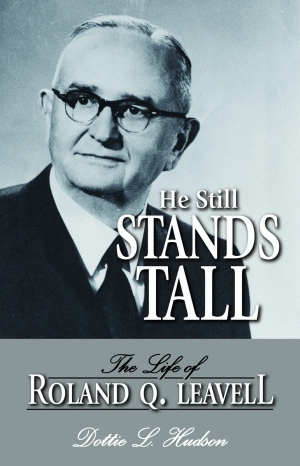 Leavell’s leadership and organizational skills made him a perfect candidate for president of the Baptist Bible Institute in New Orleans. He was unanimously elected and made dramatic improvements. Seeing the need for a larger school, he sold the cramped campus in the Garden District. He raised funds and moved across town to the present spacious Gentilly campus. It became an accredited seminary which is now the second largest in the world. Although Leavell’s life was full of spiritual and personal struggles, his focus on God’s work remained his primary focus. His ultimate success can be attributed to his capacity to inspire and lead others. The youngest daughter of Roland Q. and Lilian Leavell, Dottie L. Hudson, compiled twenty years worth of her father’s diaries for this first biography. Hudson is a family and marriage counselor and a popular speaker for church retreats and civic and professional organizations. She is married with three grown children. Her husband, Carl, is a former staff member of the New Orleans Baptist Theological Seminary.